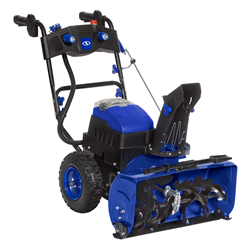 National Hardware Show (NHS) attendees will get front row seats as Snow Joe® takes the world by storm with its iON Dual Stage Snow Blower – the first completely cordless, self-propelled, battery-powered two-stage snow blower. Two-stage snow blowers have motor-driven wheels and are capable of covering large, uneven areas. These blowers feature a process that moves snow faster and farther – first collecting the snow with an auger, followed by an impeller fan that powerfully discharges snow through a chute. This revolutionary rechargeable is just the latest from the company known for innovation in outdoor tools. Along with the iON Dual Stage, Snow Joe + Sun Joe’s robust suite of electric and cordless outdoor maintenance and gardening products will be on display at NHS. Powered by twin iON EcoSharp® 40 V 4.0 Ah Lithium batteries (the same used in Snow Joe + Sun Joe’s entire fleet of cordless iON products), the easy-to-use iON Dual Stage provides 30 minutes of whisper-quiet, self-propelled run time as it effortlessly carves a swath 24 by eight inches wide, moving 600 pounds of snow per minute – or nine tons on a single charge. Convenient and useful features are abundant on the iON Dual Stage, including wide studded snow tires for increased traction, a 180-degree adjustable shoot capable of moving powder 32 feet precisely to where the user wants, powerful LED lights, digital shift technology and more. The advanced three-speed digital drive system sets the perfect customizable pace, and the reverse function helps the user back out when the dirty work is done. Attendees at NHS can get the first coveted look at the iON Dual Stage by visiting Booth 11229 during the show. The Snow Joe + Sun Joe Booth 11229 also will show off the rest of its extensive catalogue of popular, eco-friendly, electric and battery-powered innovations for all seasons. More information can be found at http://www.sunjoe.com or by visiting the Facebook page at http://www.facebook.com/snowjoeco or Twitter at http://www.twitter.com/snowjoe. The Snow Joe® Company designs and develops high-quality innovative tools at an affordable price. Since 2005, the company has helped consumers “Get Equipped” to tackle the great outdoors. Snow Joe’s innovation is driven by a robust research and development pipeline that looks at both creative design and technological advances. Originally founded to bring homeowners smart winter solutions, the company now distributes a wide range of easy-to-operate and reliable power equipment – from snow throwers and lawn mowers to trimmers and cultivators – under its “Joe” brand names. For more information, visit http://www.snowjoe.com.